Some animals conserve body heat through physical contact with conspecifics (i.e., huddling) under cold climate conditions. However, the factors that promote huddle partner selection have not been clarified. We hypothesized that exchanging grooming for huddling is a beneficial strategy used by female Japanese macaques (Macaca fuscata) to withstand cold temperatures. In this study, we undertook focal sampling of 17 female macaques at Katsuyama, Okayama Prefecture, Japan, between April 2012 and March 2013. We used generalized linear mixed models and determined influential factors based on the Akaike information criterion. As a result, we found that female Japanese macaques were likely to participate in grooming interactions before huddling with adult females, but that they rarely did so before huddling with their young (1-year-old or younger) offspring. In particular, adult females tended to huddle with other adult females after unreciprocated grooming bouts. Moreover, they solicited return grooming less frequently when females huddled after grooming interactions than when they did not huddle after grooming interactions. Finally, we evaluated whether grooming improved huddling position. Immediately after grooming, females huddled at advantageous positions more often than they huddled without grooming, and relative benefit by huddling position in the groomer was likely to be larger than the groomee. In contrast, when females huddled after reciprocal grooming, females tended to huddle in positions that were equally beneficial to both females. Overall, our results suggest that female Japanese macaques, particularly those without young offspring, exchange grooming for huddling with other adult females. Huddling is a thermoregulatory behavior performed under cold climate conditions; however, the factors promoting huddle partner selection are unclear. 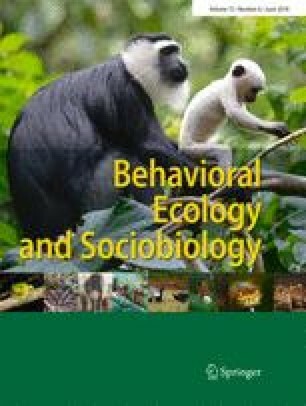 In several animal species, including primates, individuals exchange grooming for reciprocal grooming or other social benefits, such as access to infants and agonistic support. This study showed that during winter, female Japanese macaques obtain huddling benefits in exchange for grooming. However, females with young offspring were unlikely to use grooming to huddle with adult females because their offspring act as huddling partners. Thus, the use of grooming by Japanese macaques as a payment is flexible, depending on the needed benefits of the individuals. To our knowledge, this is the first study to suggest that huddling is a potential commodity that females trade in exchange for grooming. MU is sincerely grateful to K. Yamada, K. Onishi, S. Ichikawa, N. Katsu, and members of the Department of Ethology, Graduate School of Human Sciences, Osaka University. MU also sincerely thanks Y. Hori for providing analytical support. We would also like to thank Dr. David Watts and anonymous reviewers for their helpful comments. This study was supported by the Research Fellowships of the Japan Society for the Promotion of Science (JSPS) for Young Scientists (No. JP232887, JP20179930 to MU). The study was approved by the Animal Experimentation Committee of the Graduate School of Human Sciences, Osaka University, Japan (No. 19-11-0, 24-2-0) and performed in accordance with the ethics guidelines.